Oh pine nuts! For those who know me, you may be wondering if I have eaten one in the past year. For those who don’t know me, you may be wondering why anyone would wonder if I ate a pine nut. The answer to the former is: sort of. The answer to the latter: it’s a really show stopper when I eat the corn-shaped nut. Full allergy anaphylaxis take me to the hospital or lose me forever sort of show. And, somehow, I managed to come to live at the epicenter of all pine-nut producing and consuming countries. Before this turns into a woe is me poor gal had to move to Rome and avoid pine nuts, life is sooooo hard, I write this because – oddly, in the most strange way, the process of avoiding the prolific nut has unfolded some great nuances about Italy and its pine nut proffering people. My first run in with a pine nut was in the least tragically romantic locale possible: at our own breakfast table. It started like most oatmeal mornings – raisins, almonds, cinnamon, a little milk. But I got that ‘thrill of the throat’ that only comes with a pine nut reaction, and couldn’t figure out where this stealth bomber pine nut was coming from. Seeing as I am just too square to take chances with a potential blockbuster pine nut reaction, I downed the Benadryl and stood ready with my epi pen, like some wacky self-lifeguard ready to plunge that little device made so popular by Pulp Fiction. While I have neither the drug addiction or stature of Uma Thurman, I do have a very real need for the epi pen. Lucky for me, the reaction seemed to have leveled after the requisite reappearance of the downed oatmeal. A couple of original Cokes to settle the stomach and a Benadryl induced daytime hibernation, and it was clear I would live after all. Later upon inspection of the tall plastic bag into which I deposit my bulk almonds at my trusty market nut guy, I found the culprit. There, somewhere nearish to the bottom, sat the little son-of-a-nut. It must have jumped ship from one of the other nut bins, not unlike the vastly unpopular Italian cruise ship captain Schettino, who claimed to have fallen into the life boat. And I am sure this little nut just ‘fell’ into the almonds. Likely story. They can be creepy little nuts indeed. And now we have rule number one: no bulk nuts. Nutty for nuts! 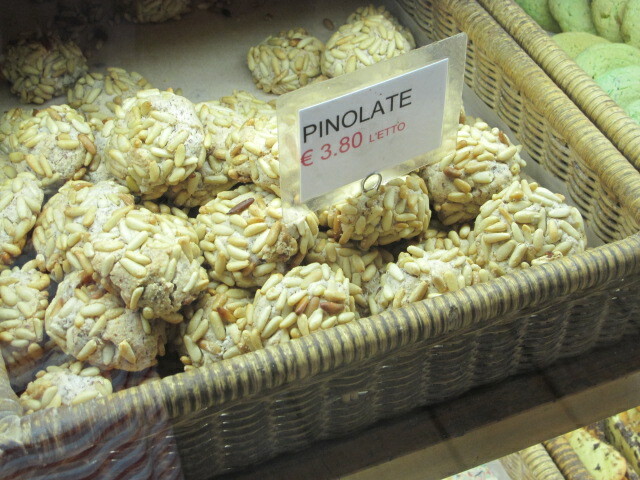 A dried goods stand often carries those pesky pinoli. The second and hopefully last encounter with the pinoli took place a couple of weeks ago, while out with some visiting friends. We promised to woo them with the best cappuccino in town, and carry on the lactose festivities at one of the most famed gelato shops. I can handle the jabs in the side while jockeying for a position at the gelato counter, but the scratch in the throat is a whole other beast. After taking my first licks of fig-caramel and hazelnut ice cream, I sensed it again. But I have never been allergic to any other type of nut. You scream! I scream! We all scream I have to run home and get some Benadryl! Yet another minor reaction (no fun ride in an Italian ambulance), but those fox-like nuts keep showing up in weak shadows of their potent kernel form. They must have dipped the same spoon into other ice creams – and now, if pinoli flavored ice cream is on the menu – I don’t get a gelato. Now you can start feeling VERY sorry for me!!!! I scream!!!!!! 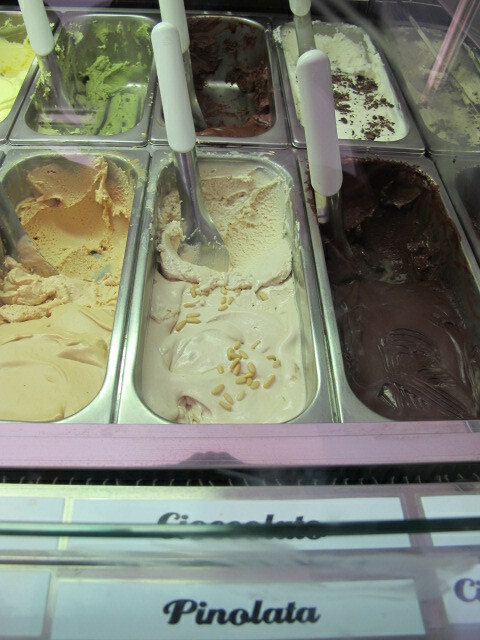 Pine nut Ice Cream!!!! 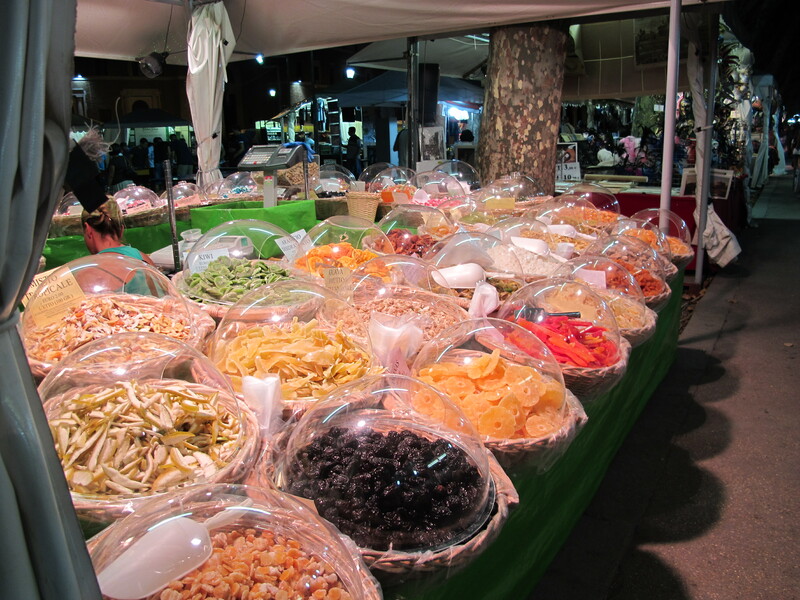 Pine nuts otherwise run rampant in Rome. Baccala alla Romana – made with salted cod-fish and tomatoes, is full of them. Pesto is a given and although originating in Genoa, has become an international sauce and is very much alive in Rome. 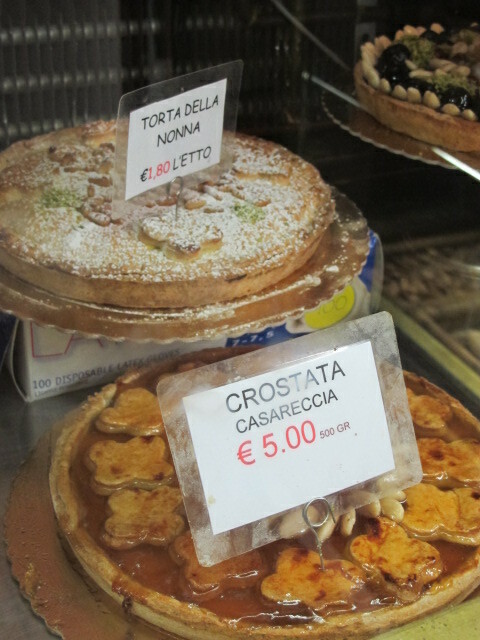 La Torta della Nonna, or grandmother’s cake, is an ode to pine nuts. Well, grandma is a cold-blooded killer, and so are all the other numerous tarts and treats with a few pinoli sprinkled on top. Both these cakes feature Kat Kryptonite. With all these pine nuts around, its amazing really, that I have only had a couple scuffles. The reason why lies in the attitudes toward Italian cuisine – and this attitude alone has for the most part protected and successfully screened pine nuts clear of my plate. When I go into a restaurant – no matter what I am eating, I always ask if it has pine nuts. The Italian waiter, in his baffled state of why I would ask such a stupid question, nearly always replies, NO! His what-are-you-crazy look and response of “This is amatriciana – its bacon, red pepper, tomatoes and garlic – and that’s it!” They really just don’t screw with the recipes here. They stick to them. Like glue. I have seen heated arguments of whether you can add onion to the aforementioned amatriciana, with banter sounding not dissimilar in tone and rising tempers that you might hear from two Americans arguing over whether Romney’s little army of children really couldn’t spell their last name correctly, or if it was all the work of Photoshop. Italians take their food very seriously, it is personal, and to stray too far away from the prescribed ingredients would be to commit culinary heresy. Because they remain so faithful to their food traditions, knowing what dishes pine nuts go into, and those which don’t, is half the battle. The really comforting other piece to this is, they know what is going into their dishes. I don’t have to worry about a 50 gallon barrel of olive oil that has been infused with pine nuts that even the chef doesn’t know about. They just don’t process like that. They keep it simple, fresh and pure. And that is really the basis of what all Italian cooking is – using the fewest amount of fresh ingredients to make the fullest food experience possible. The dish Olio, Aglio e Peporoncino, is a testament to that – just pasta olive oil, garlic and crushed red pepper. Simple, fresh and pure, and of course, free of pine nuts.